Practice putting to improve your score. Many golfers consider putting a secondary part of the game and spend more time practicing hitting their woods or irons. Yet putting accounts for 43 percent of the game, according to the PGA Teaching Manual. For golfers who want to shave strokes from their game, the putting green is one of the best places to do it. Practice your putting. Before you hit the course, take some time on a practice green. Grab two golf balls and practice long putts (10 feet and beyond) and short putts (within about 5 feet). While the goal with long putts is to make them, that goal is not always realistic. Your secondary goal, therefore, should be to leave yourself with a short putt. 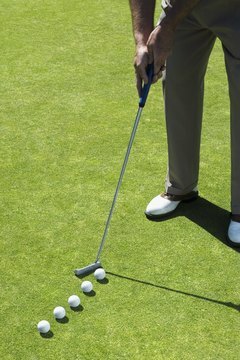 Your goal should be to make all of your short putts, because doing so while you are practicing will give you confidence when you are playing a round of golf. Learn to read the greens. Kneel behind your ball and look at the path to the hole. Does the green tilt one way or the other? Are there multiple places between your ball and the hole where the terrain is uneven? As you read the green, imagine what the terrain will do to the path your ball is taking. Again, practice is an important part of being able to read greens. While you are on the practice green, seek places where the green slopes and hit your ball through the breaks. See how the ball reacts and keep the results in mind when you play on the course. Maintain a routine. Putting is a mental game, and a loss of confidence in your putting stroke can be particularly detrimental. Developing and maintaining a putting routine strengthens your mental game. Kneel behind the ball and read the green, no matter how short the putt. Take a practice stroke, then address the ball. The individual elements of the routine are not as important as having a routine. By doing so, you will approach each putt the same way and maintain your comfort level on the green. Strike the putt. If you have practiced putting enough, you will not think about the mechanics of the stroke. Instead, you will be focused on the correct speed and on the correct line. A good way to determine how hard to strike the putt is to pretend you are bowling your ball toward the cup, instead of striking it with a club. The force with which you hit the ball should be the same force you would use to roll your ball to the cup. Keep in mind, too, that if the green is sloped, you will have more success aiming toward the high side of the cup. Even if your putt is off line, gravity will force the ball toward the hole.